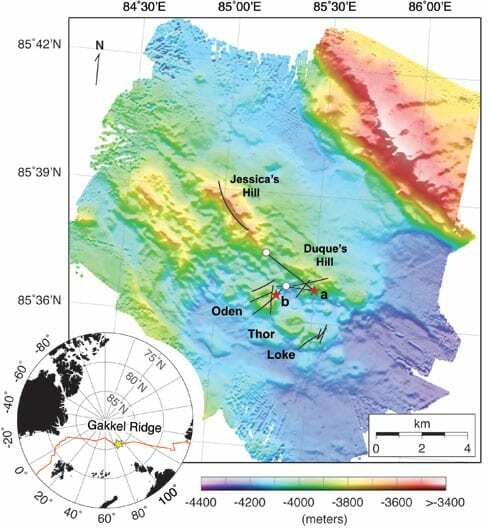 A research team led by Woods Hole Oceanographic Institution (WHOI) has uncovered evidence of explosive volcanic eruptions on the Arctic Ocean seafloor almost 2.5 miles deep. Scientists did not think volcanoes submerged under such intense water pressure were capable of such violent eruptions. 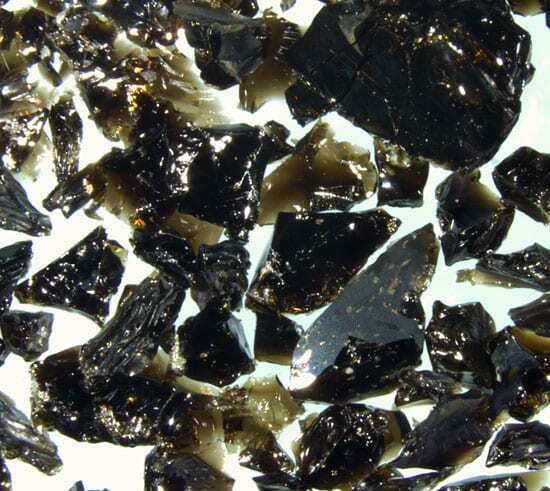 Researchers found jagged, glassy fragments of rock (called pyroclastic deposits) spread out over a 4-square-mile (10-square-kilometer) area around a series of small volcanic craters on the Gakkel Ridge, a remote and mostly unexplored section of the mid-ocean ridge, the volcanic undersea mountain chain that wraps around the globe. Reves-Sohn was lead author of a paper, co-authored by 22 researchers from nine institutions in four countries, that was published June 26, 2008, in the journal Nature. 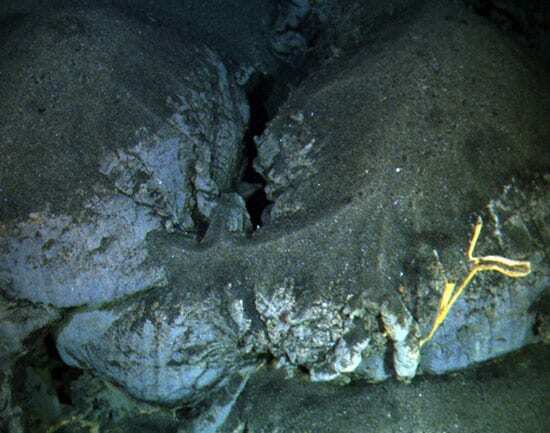 Seafloor volcanoes usually emit lobes and sheets of lava during an eruption, rather than explosive plumes of gas, steam, and rock that are ejected from land-based volcanoes. Under the intense weight and pressure of water, it is difficult to build up the amount of steam and carbon dioxide gas required to explode a mass of rock up into the water column. Far less energy is needed to do so in air, so ocean eruptions are more likely to resemble those of Kilauea than Mount Saint Helens or Mount Pinatubo. On the Gakkel Ridge expedition, researchers used a combination of survey and sampling instruments to examine the seafloor and collect samples of rock and sediment, as well as dozens of hours of high-definition video. They saw rough shards and bits of basalt blanketing the seafloor and spread out in all directions from the volcanic craters they discovered and named Loké, Oden, and Thor. They also found deposits on top of relatively new lavas and high-standing features—indications that the rock debris had fallen or precipitated out of the water, rather than being moved as part of a lava flow that erupted from the volcanoes. 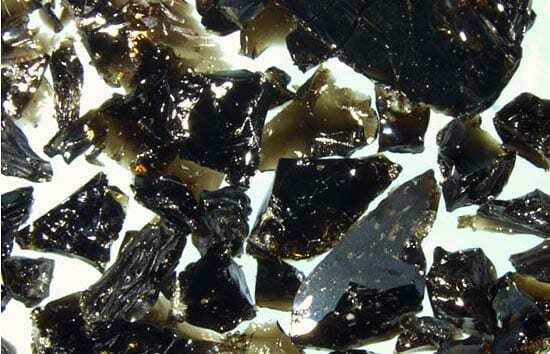 Closer analysis has shown that the some of the tiny fragments are angular bits of quenched glass known to volcanologists as limu o Pele, or “Pele’s seaweed.” These fragments are formed when lava is stretched thin around expanding gas bubbles during an explosion. Reves-Sohn and colleagues also found larger blocks of rock—known as talus—that could have been ejected by explosive blasts from the seafloor. When the finding was reported, some naysayers of human-caused greenhouse warming claimed that explosive Arctic seafloor volcanoes could be a natural cause for recent melting of polar sea ice. But that theory has no merit. The Arctic Ocean is a huge reservoir of water that can readily absorb and disperse the heat and volatile gases from the volcanic eruptions at the seafloor. 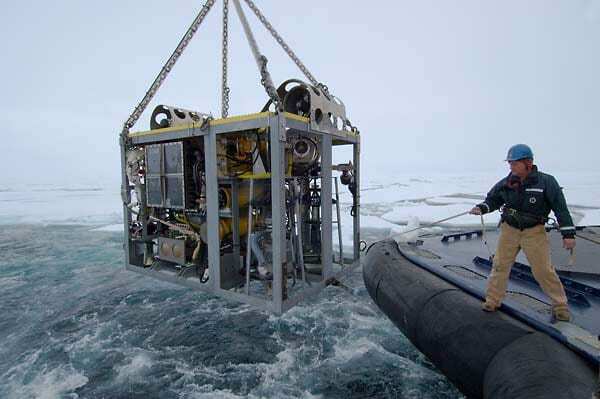 The water in the Arctic Ocean is also stratified—layered like a cake—with lighter layers lying atop denser layers of water, like oil atop water. (Colder and/or saltier seawater is denser than warmer and/or less salty seawater.) Waters in the Arctic depths remain trapped near the bottom. They do not mix much with surface waters. Almost no heat is transmitted all the way up to the underside of the ice from volcanoes 3,000 to 4,000 meters (approximately 2.5 miles) below.